This Skull Face Mask is just for you. Put it to work on the road, in the ring, or while you are trick or treating. It is fun enough to rock in a laid back atmosphere but still has that aggressive look to make you look way cooler on your motorcycle than you actually are. 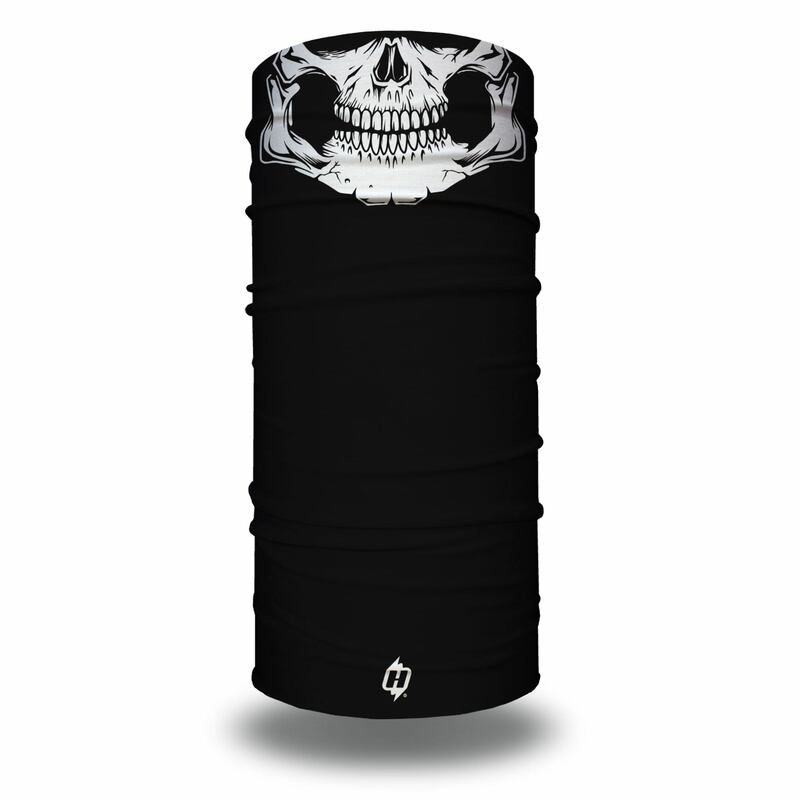 You asked for it, here it is.”Skull Daddy” Put it to work today. I ordered this, it fits me perfectly, and I wear it everyday! Fits me perfectly, feels good and looks mean when I ride my bike. My 13 yo nephew specifically wanted this hoo rag . He loves it. I do admit the fabric was a lot thinner than I expected, but it does what it’s supposed to do. For the price I thought the material would be a bit thicker, I was somewhat surprised at how thin it was upon opening. 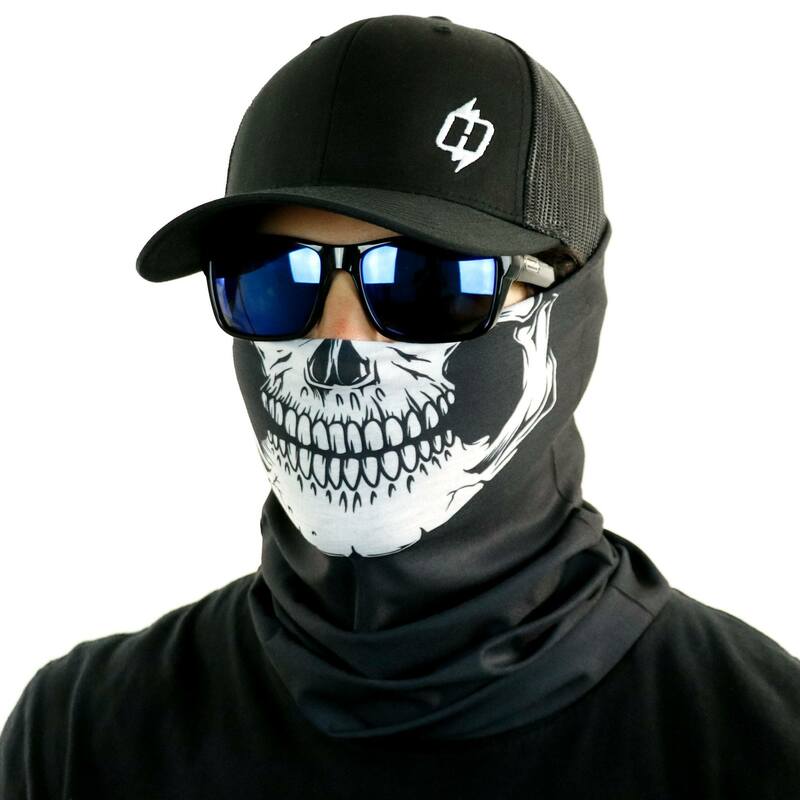 Overall I like it for the design and it does keep my face warm, So no complaints on functionality. Came in the mail on a day that it snowed. Perfect timing. Wore it out to shovel my driveway. Worked perfectly at protecting my face from the wind. And keeping it warm. Had an associate purchase this item. He is extremely pleased with the quality and versatility of this product. He could not believe the total price of each item! Very satisfied customer! Great buy! I love it. Will definitely be buying more! My favorite Hoo I have, and I have a lot. Amazing quality and design! I love wearing this while I ride. It keeps the sun and bugs off my face, while remaining comfortable, and it doesn’t irritate my beard. bought this for a female friend. she loves it. shipping was fast and furious. I love the design – It fits well, a little tricky to get it lined up right on my face (yes, I’m particular like that lol), but the product itself absolutely works. Wore this for a 5k, Got a lot of compliments. Absolute great product! Customer service is fantastic!! Thanks for being a great company! I’m very happy with this product, absolutely love the quality! Keep me fresh! , great product! Just a gun, badass way to rip in the boat! Awesome hoo-rag and a true classic. Love using it for fishing, snowboarding, and riding. Much higher quality than other brands I have ordered in the past too! Awesome hoo-rag and a true classic. Love using it for fishing, snowboarding, and riding. Much higher quality than other ones I have ordered in the past too! Nothing but quality and a very fast shipping (Canada). I love it!!! AWESOME PRODUCT and FAST SHIPPING!!! Definitely will be back for more. Thank you. My husband loves it. It was a Christmas gift he asked for to use on his bike. Great product and a fine American company. My order was filled & delivered in about 5,6 days. I will be doing more business in the future. A very user-friendly web site. It came quickly. I’m anxious to see how it is received as a Christmas gift. Great product and fast shipping! Thanks HooRag! Looks awesome-fast shipping. More to come. For a skull design its killer,fits well and comfortable.Fast shipping and a good price.Thxs for a good product. Works great, looks great. Fast shipping great price. Excellent product I’m highly recommend it. Great product at a great price.I love it! Awesome rag, very comfortable. 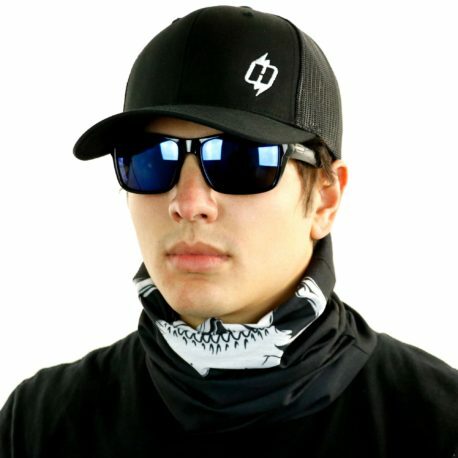 Not only a cool addition to my Oakland Raider gear I wore to the game this Sunday, it protected my neck from sun. Great product.Thanks guys. So cool. Got it for my husband. He loves it. One of the all time great Hoo’s and went into my urban to-go bag. So many positions it can be worn in. A great add to my vast inventory of Hoo Rags! I have been looking for this exact thing and it is perfect. My husband loves it because he looks like a badass on his bike. Haven’t washed it yet but feel all will be great! Thank you! Keeps the sweat off of my face better than any product I’ve used and very versatile. Love it! Great quality and fits well on any size person. These things r dope af + only took like a week to arrive in Australia. Thanks Hoo-rag u guys rock. Thanks to the Skull Daddy hoorag I now have graduated top of my class in the Navy Seals. I operate more tactically than ever before, and have over 300 confirmed kills. Forget motorcycles and football games, I wore this on the Bin Laden Raid. Ever since I bought this mask I’ve been able to smell sound and talk to bald eagles. Every day this mask (made in the USA) fills me with freedom and justice, unlike the terrorists I kill. Who I fill with fear and lead. God bless Hoorag, and God Bless America. All I can say is buy a Hoorag if you have not already. 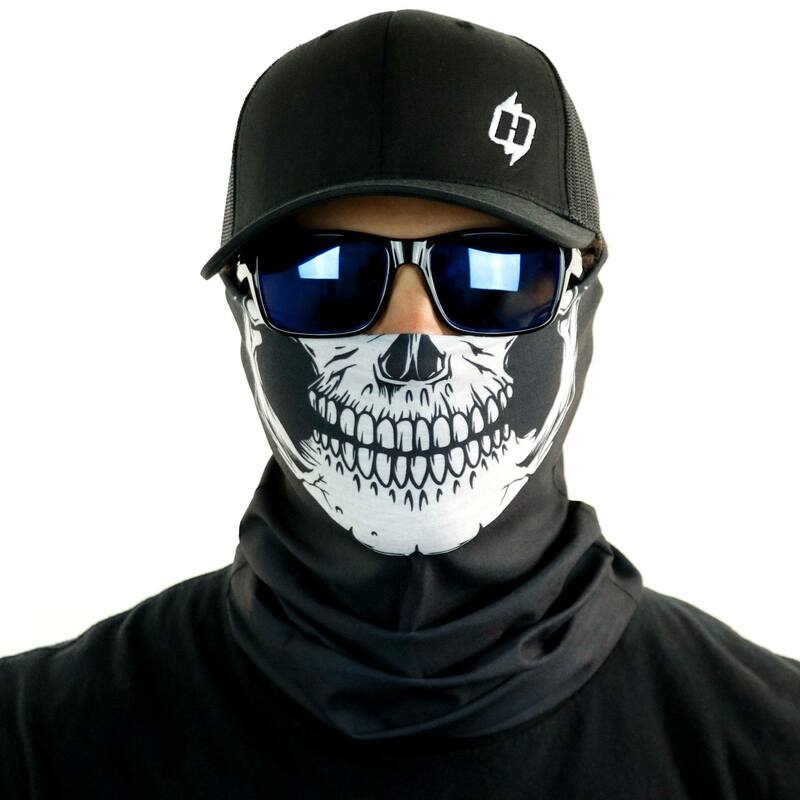 I use my skull daddy when I ride my motorcycle, and use it as a beanie under my hard hat at work. It not only looks great but it is functional as well. Thank you Hoorag! This product is great. Very durable, great material used, and stylish. Not only am I very satisfied with the product, but also the company and their customer service. Thanks a lot Hoo-Rag! great hoo, but i learned the hard way that you should not ever put in the dryer. I want to buy one, I live in Canada. I want to use it for football how long will it take to get to me?? Any international shipping can take from 6-30 days depending on location and customs. The best we can tell Canadian customers is that it should be sooner than later since you are closer to the US. Hope this helps! Skull Daddy Hoorag is the Best design yet. Protects me From Bugs, Rocks and Wind While On my bike. Thats my 3rd Hoorag and I will be buying More in the near future. The product was exactly what was expected. Works great for the shock factor! There was an issue with receiving my order but it was quickly resolved with great communication from the customer service folks! Loved the skull daddy…that thing just looks sick. Very breathable, and comfortable….I’ll be using this for Halloween this year with my kids. Great rag for dune riding! These rags are great. I have this one and the sugar daddy hoo and they look are perfect for riding on the motorcycle. Keeps bugs out of your face and it doesn’t make your face sweat but it keeps you warm on the colder nights. Awesome product. Definitely recommend! This hoorag design is sweet and the product works really well. I wear it to ride my motorcycle and it has not let me down yet. Works great to keep my neck, face and ears warm in the cold months and keeps me from eating bugs and whatever cagers are throwing out there windows. Exactly as advertised, which is nice to see. All expectations were met if not exceeded. Will definitely order again. I love it! The material is super cool and breathable (like all my Hoorags) and the design is sick. It may possibly be a good luck charm, too: the first time I used it on a fishing trip, we got our limit of salmon AND we got to watch Orca Whales feed on salmon right in front of us for the first time. Needless to say, I’ll be bringing this on all of my trips from now on! Great product! Love my skull daddy design! Very breathable, protects my neck, ears, face, and more from the sun. Easy to wear. Fades out after a few washes.